The PKL is available in 1×4, 2×2, and 2×4 sizes, in 2, 3, and 4 lamp, T5, T5HO, and T8 and BIAX in a variety of cell configurations. 1-1/2” deep, anodized aluminum, parabolic contoured louver provides optimum performance and efficiency, while ensuring a high level of visual comfort. Flush steel-hinged and latched door frame. Frame hinges from either the open or closed position by die formed steel hinges. Integral T-Bar clips on 2×4 and 2×2 fixtures quickly, securing fixture to the grid system without the need for external parts. Fixture housing flanges rolled to eliminate sharp edges. Optional heat removal housing for venting air into plenum. For mounting in exposed T-Bar (grid) ceiling. Optional flanged construction for other ceiling types. For individual or continuous row mounting. Die-formed heavy gauge steel unitized into one piece. Standard unit supplied as static with flush steel door. Optional 20 gauge housing. 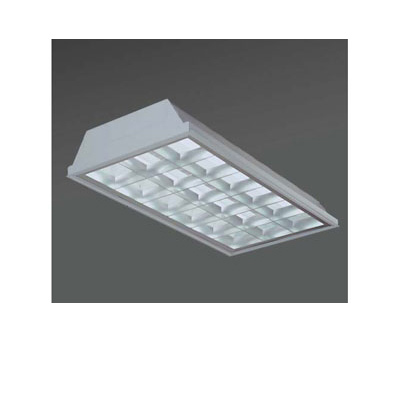 Energy-saving electronic ballasts comply with Federal Energy Efficiency standards. Ballasts are <10% THD and include 5 year manufacturer’s warranty. 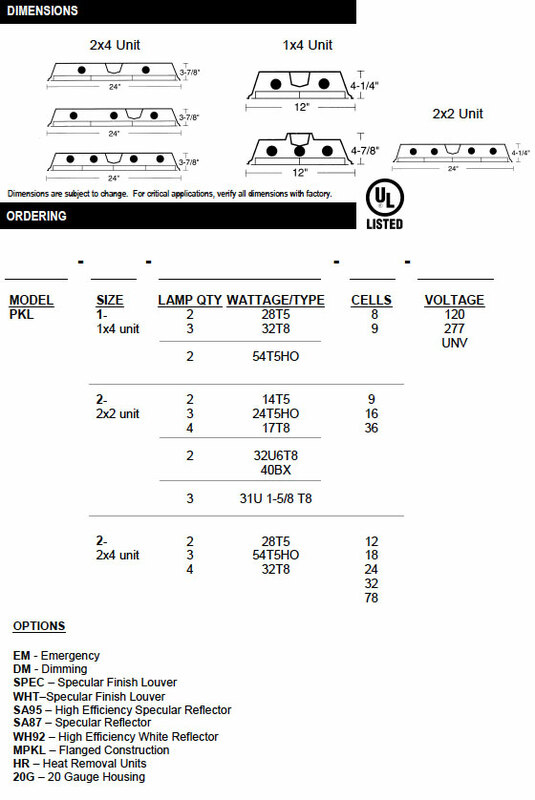 Ballasts operate on 120V-277V (UNV) unless specified otherwise. Anodized aluminum louver, precision mitered. Standard finish semi-specular silver. Optional specular silver or white finishes are available.